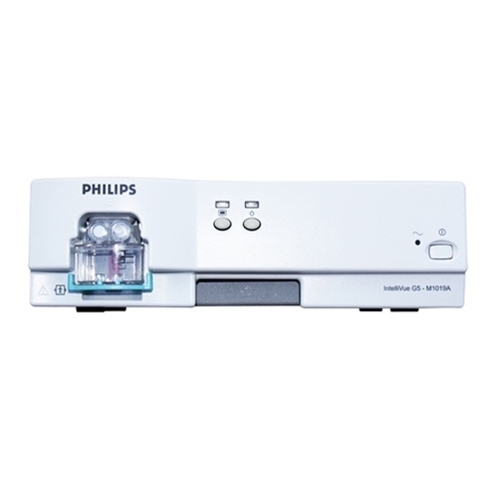 The Philips IntelliVue G5 M1019A anesthetic gas modules measure the five most commonly used anesthetic gases, as well as nitrous oxide (N2O) and carbon dioxide (CO2). Waveforms for all gases are displayed on the connected patient monitor along with inspiratory and end-tidal numerical values. The IntelliVue G5 automatically identifies agents and features mixed-agent measurement capabilities. The compact footprint of the IntelliVue gas modules makes them practical for use in lower-acuity settings. At the same time, advanced capabilities such as automatic agent ID and mixed-agent measurement are available for higher-acuity environments. The gas sensors in the G5 gas modules have no moving parts, so they are reliable and durable. Zero calibrations are completed automatically during warm-up. Questions about our Gas Modules? Soma Technology, Inc offers a wide range of Gas Modules. If you have any questions about any of our Gas Modules, or need a quick quote, call 1-800-GET-SOMA and one of our knowledgeable sales representatives will help you.